Lots of food (and my parents) in the background. 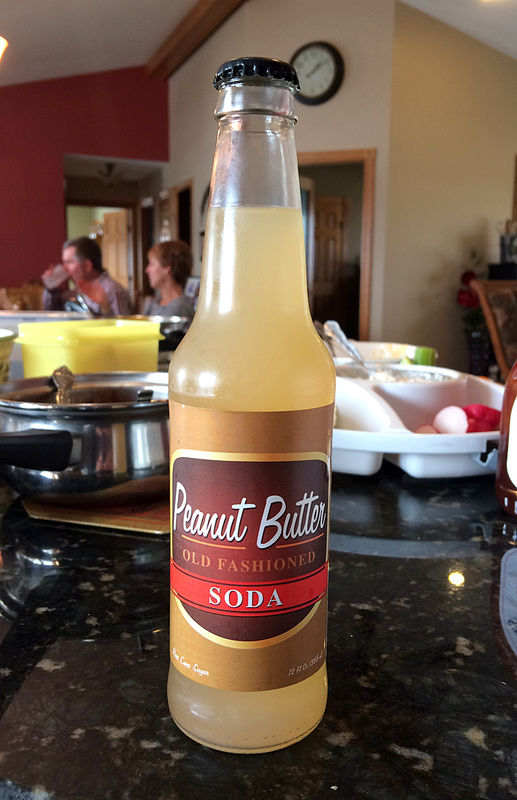 Brand: Rocket Fizz Peanut Butter Old Fashioned Soda. Review: This didn't had a strong flavor, but it didn't taste much like peanut butter. It sort of tasted like wet cardboard. It wasn't a STRONG flavor, and that's the only redeeming quality of this drink. I just bought this 5 months ago and it's been stored in our cool basement, but I feel like it was old and had gone bad. 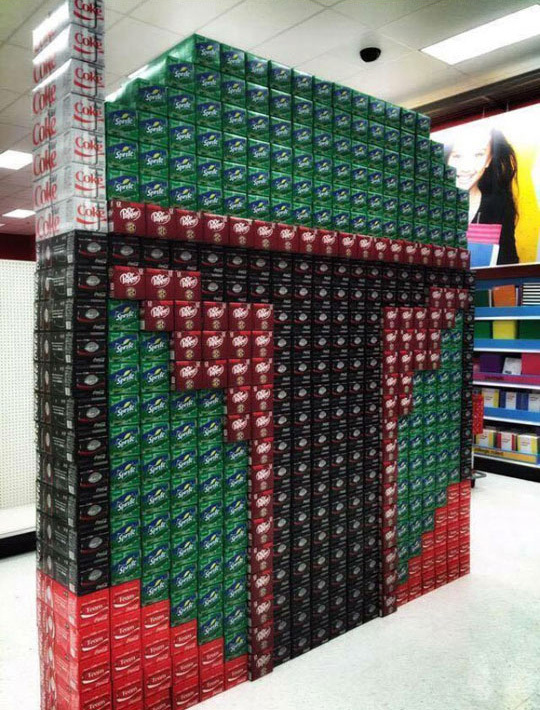 If not, this is a pretty bad soda. I guess I'm ending the year on this nasty note. 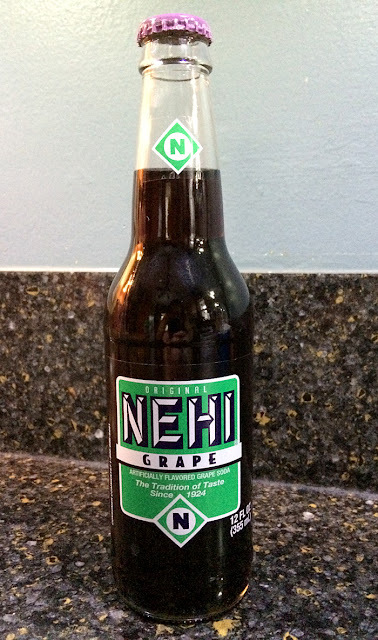 Review: This was a classic, sugary grape soda. It had a bit of a kick, but otherwise it was almost thick and "syrupy," which is the way I like it. No complaints about this! It was GOOD. I'm tempted to have this be my last soda of 2016 so I end on a high note! 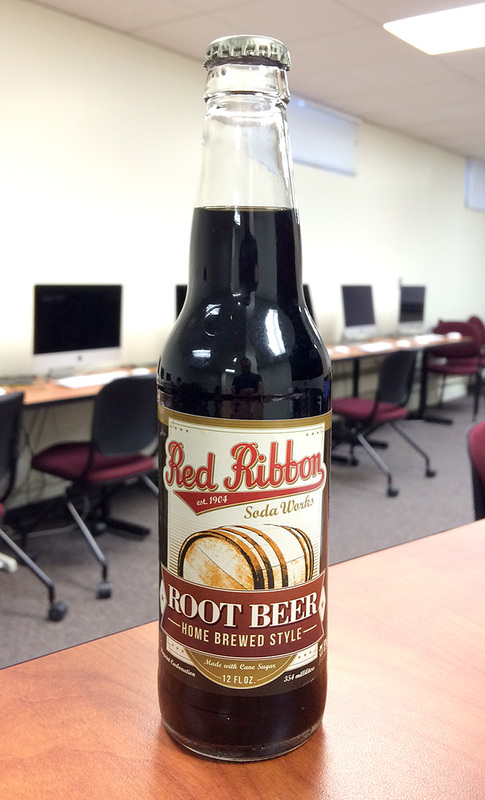 Brand: Red Ribbon Home Brewed Style Root Beer. 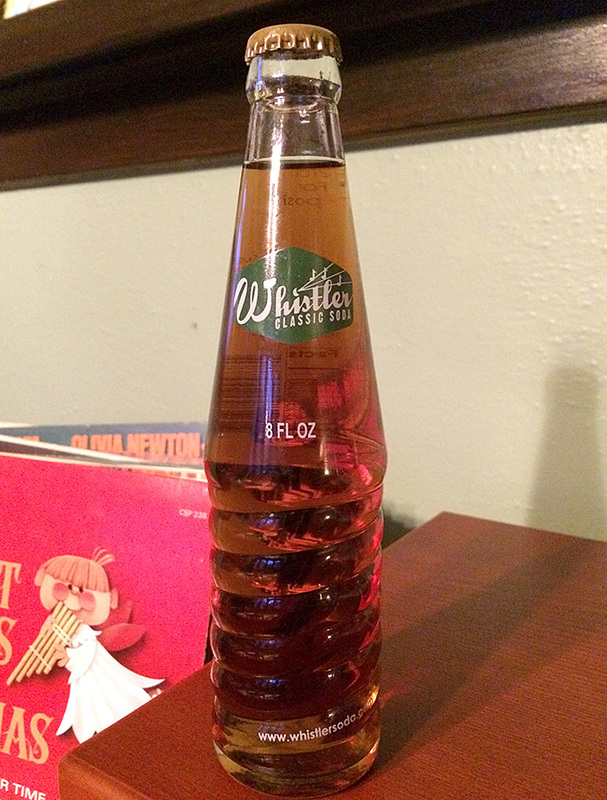 Review: This had a pretty deep, rich, classic flavor, and it was pretty smooth. But it had a decently strong beer-like aftertaste. I'm not a fan of beer, so I didn't care for that. If you LIKE beer (as most human males do), then try this, but I wasn't a huge fan, so I ranked it a bit lower than average. The back of the label. Brand: Taylor's Tonics Candy Cane Shake Soda. Origin: Santa Cruz and San Francisco, CA. Review: I was ready for this to be "not great." And it was just that. 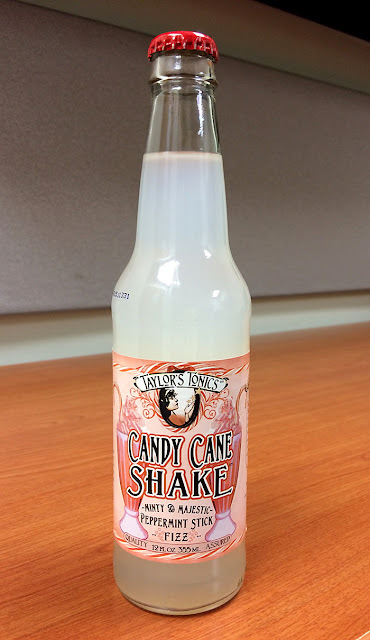 It DID initially taste like a liquid candy cane, but there was a pretty horrible chemically aftertaste. It had peppermint and vanilla in it which was fine, but it also had coconut water which didn't add the appropriate flavor. (And the last ingredient on the ingredients list is "creativity." Hardy har har.) It tasted like Christmas morning, but the kind of Christmas morning where Dad got drunk with his brothers and they all vomited around the tree. Review: This was odd. I mean, I EXPECTED it to be odd, but it was odder than I thought. 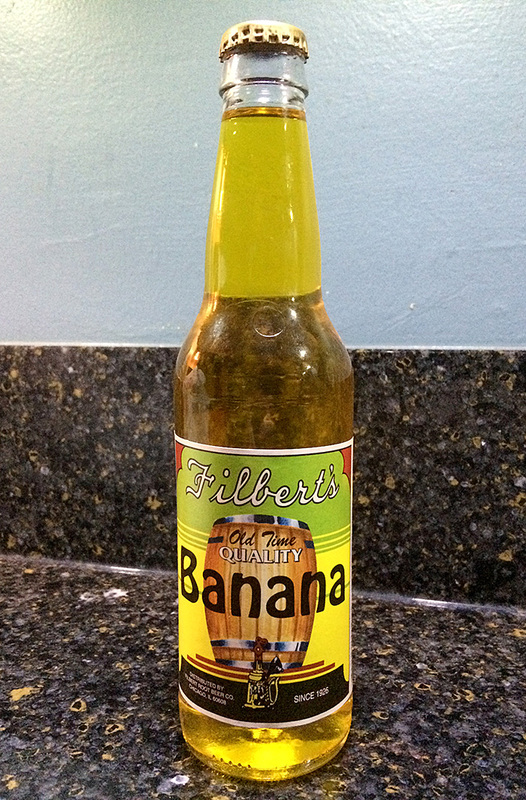 It didn't taste like "fresh" bananas, but it tasted a bit like "dried" banana chips. 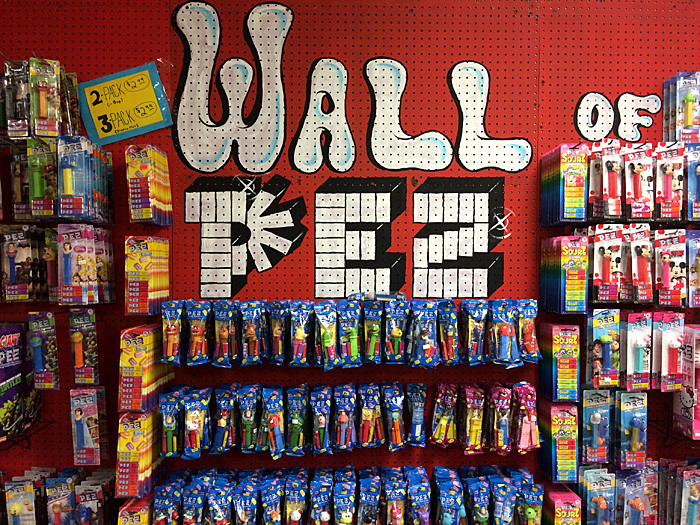 Only a bit "sharper" and harsher. It wasn't good. I didn't expect a whole lot, but this still let me down. Purchase Place: Blue Sun Soda Shop, Spring Lake Park, MN. Review: The first thing I liked was the unique bottle, and that it was only 8 oz. When I purchased this, they were sightly cheaper than most of the other sodas, but then they added on a $0.50 bottle deposit because Whistler reuses their bottles. In fact, there were some scuffs over the top of the neck of the bottle that weirded me out at first. 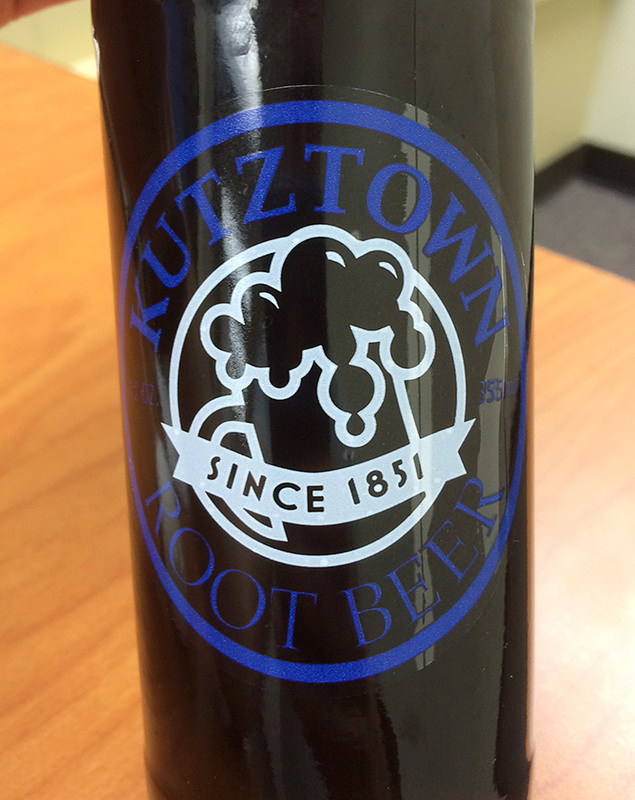 When I tasted it, it was unlike any root beer I've ever had. 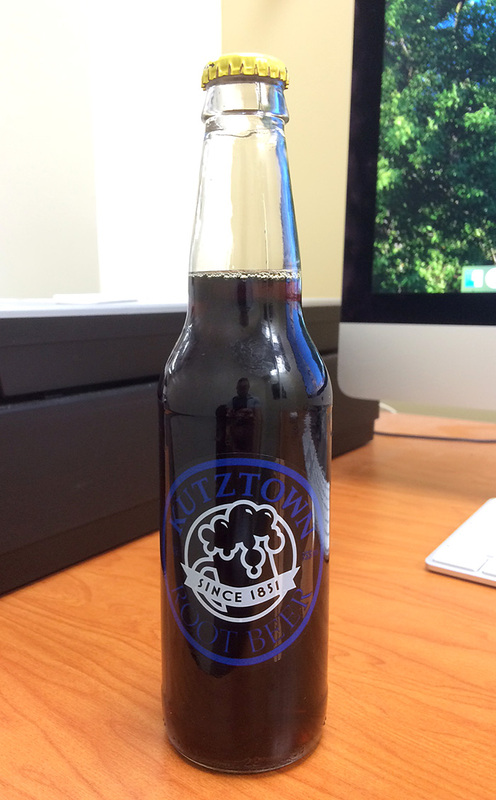 It had a STRONG brown sugar flavor, and not a lot of the "herbiness" that most root beers have. 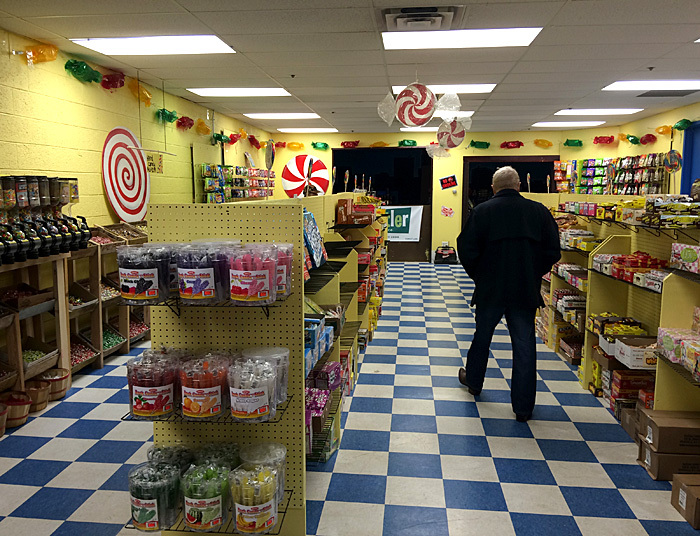 My initial thought was that it wasn't necessarily good or bad - just REALLY different. Sip after sip had me liking it more and more. 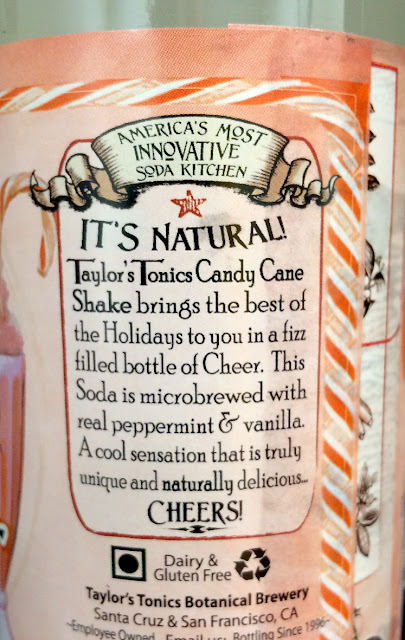 That unique flavor isn't what I expected, and if I was in the mood for a traditional root beer, this might not cut it. But in the end, I really quite liked this soda. It gets a better-than-average score for sure. 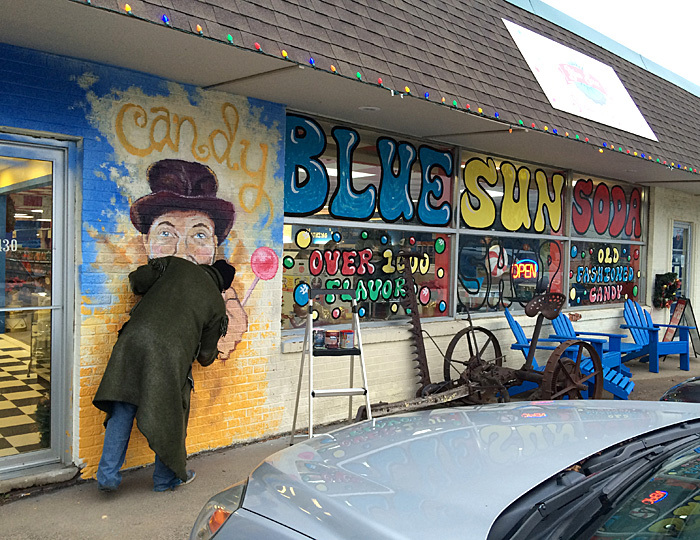 Looking in to Blue Sun's NEW ADDITION! At the end of the carpet in that photo above (under the blue trim), there used to be a wall. 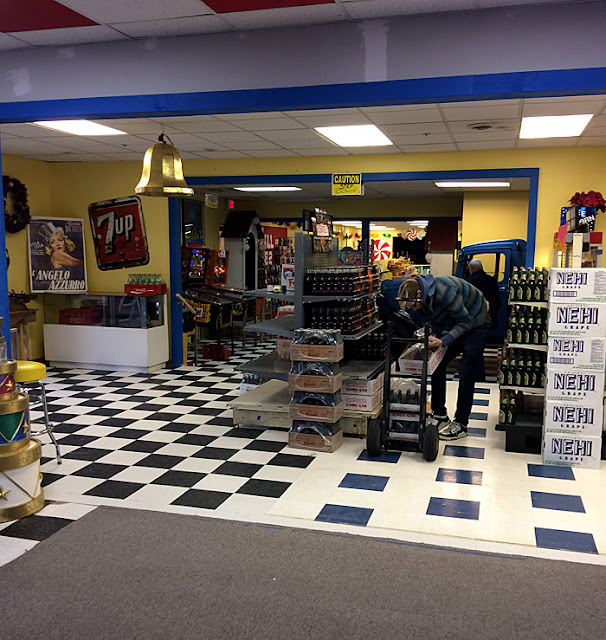 Now it looks into 3 other rooms: the first is an odd transitional room with a few soda shelves, the second has some pinball machines and an old truck, and the third is the biggest and is full of candy! 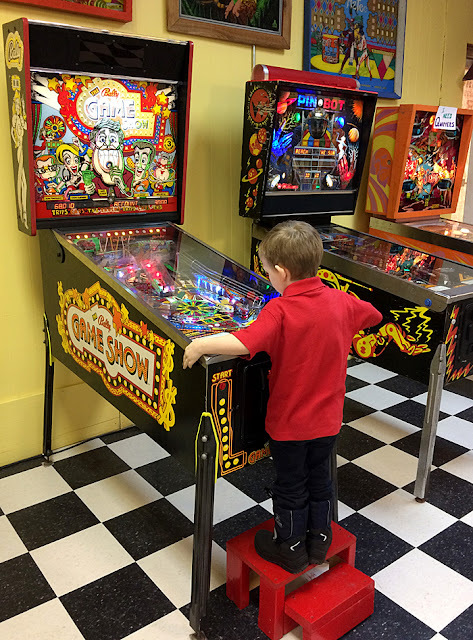 My son played a dozen games of FREE pinball (3 free machines, and 1 that's a quarter). The new candy room addition. 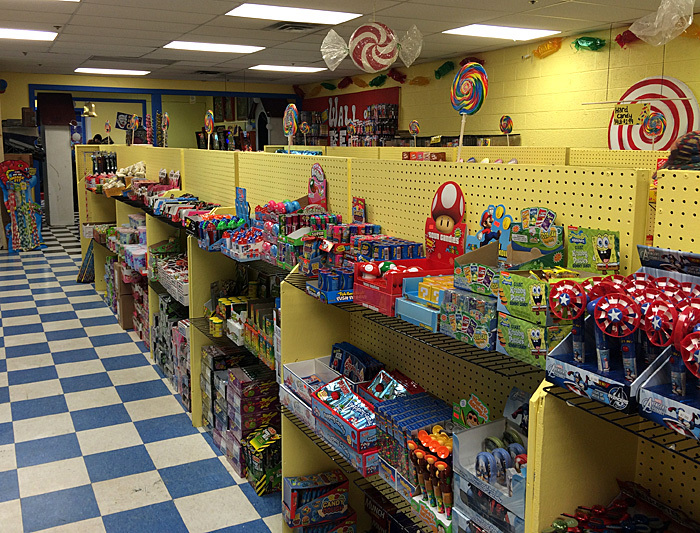 More of the candy room from the back corner. 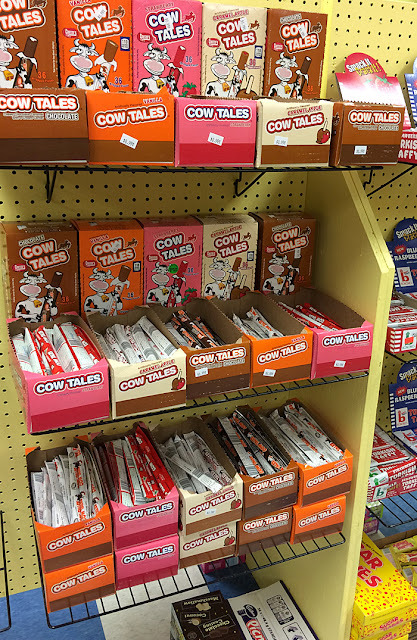 We love Cow Tails in this household! Happy to see this. Back in the "soda" part of the store, they had an end cap with all "Christmas-related" sodas. I grabbed a bottle of the white "Candy Cane Shake." Will probably be gross. 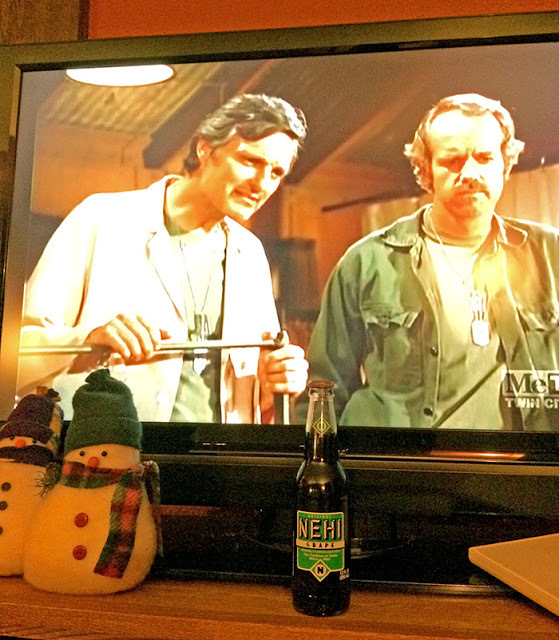 But that's OK.
ALL root beer. 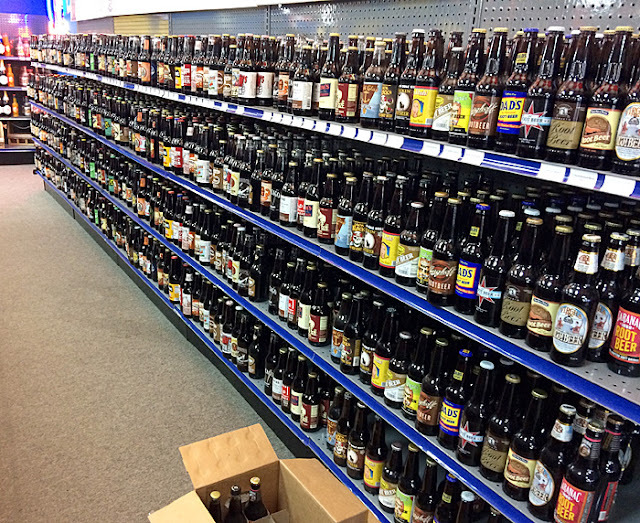 After picking this over yesterday, I *think* I've had (or just purchased) all of these. Really. Henry by the old truck loaded with soda. 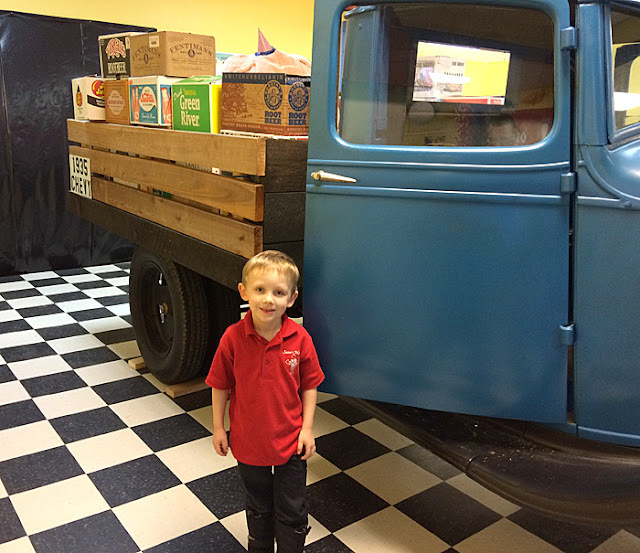 There's a room behind the truck that still needs to be finished. "Fancy" sodas that cost a bit more. I grabbed a red one on the left which was made in Germany. Some of their Minnesota-made "Whistler" bottles. 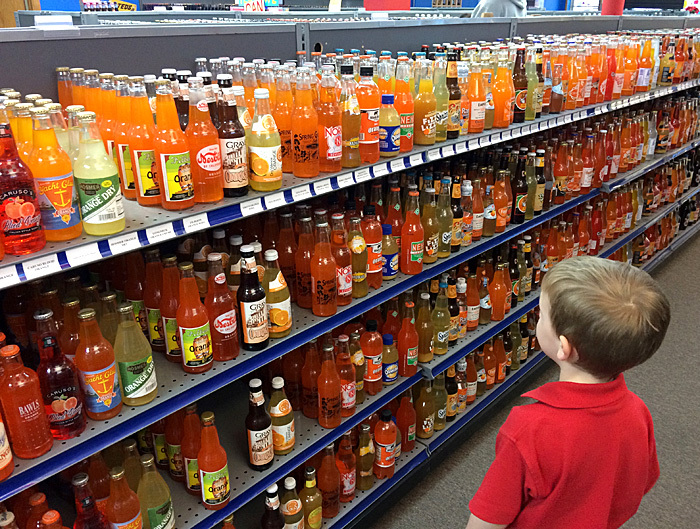 Henry thought all the orange sodas looked tasty! They had an artist painting parts of the new addition outside. 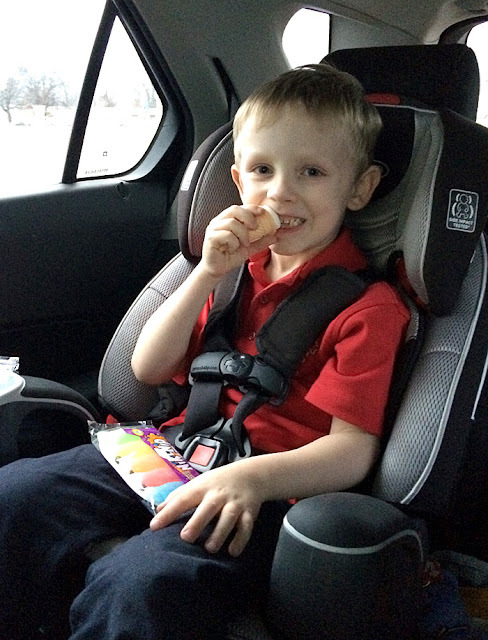 Henry eating a marshmallow treat, with "mini sodas" in his lap. 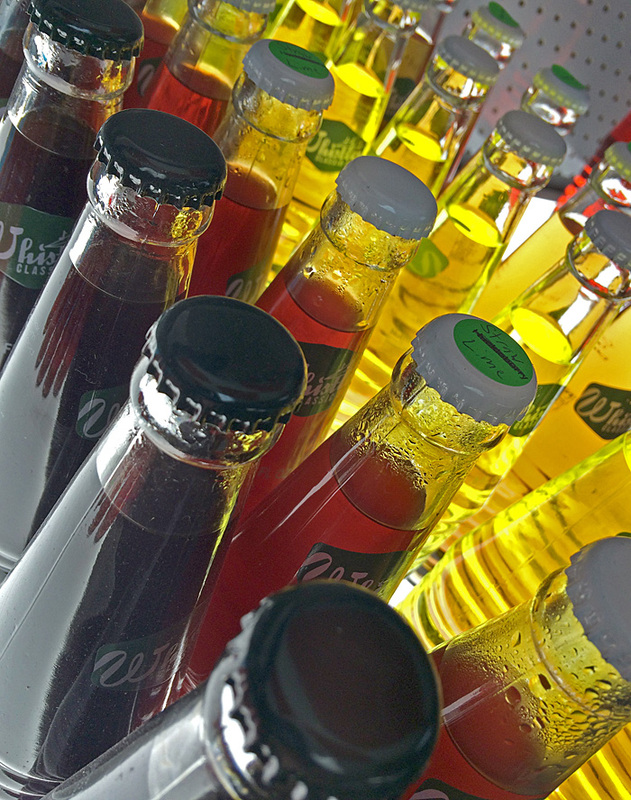 about $2/bottle on average (under $2/bottle ave without the German soda). 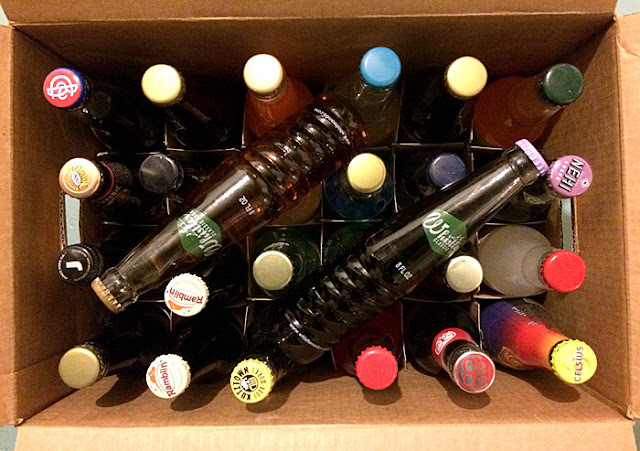 My 26 sodas at home. 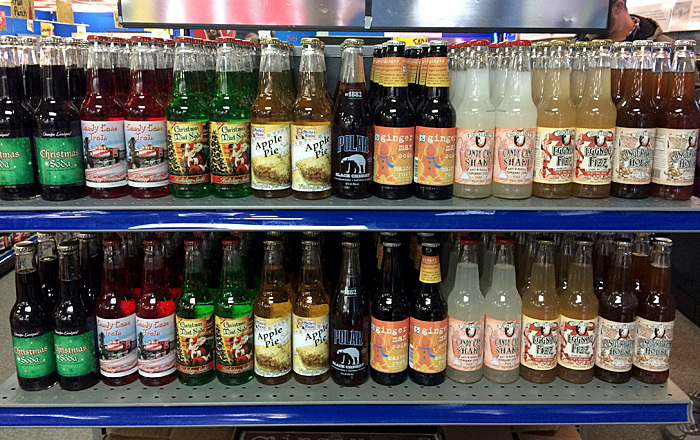 Almost half are root beer or sarsaparilla, and the rest are random. Alright, time for some sugary deliciousness!! So I grabbed the blueberry one. 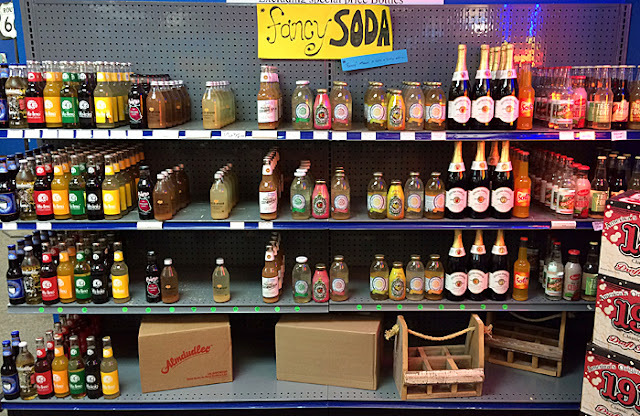 Switchel, also switzel, swizzle, ginger-water, haymaker's punch or switchy, is a drink made of water mixed with vinegar, and often seasoned with ginger. Honey, sugar, brown sugar, or maple syrup were sometimes used to sweeten the drink instead of molasses. This one has water, sugar, vinegar, maple syrup, and some fruit juices (including some ginger). It's not a soda, but it's not a traditional "healthy" drink because it only has 2% of your daily allowance of Vitamin C and Calcium. It is labeled as 14% juice. So what the heck is it? Well... it's switchel, I guess. Brand: CideRoad Organic Blueberry Switchel. Sweetener: Cane Syrup and Maple Syrup. 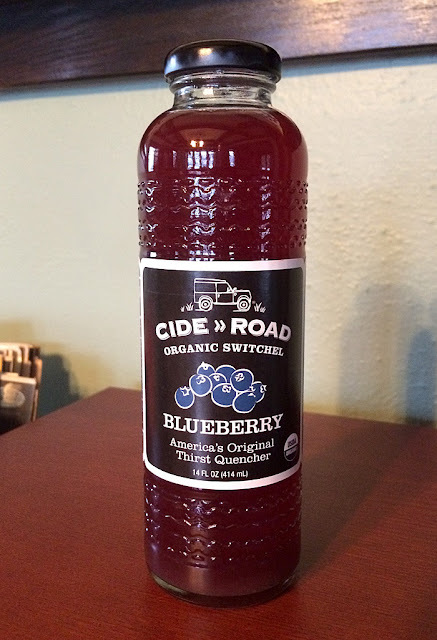 Review: I don't think I've mentioned this here before, but I'm not a fan of kombucha. I can't stand it. My wife loves it, so it's around a lot. Well, this is a bit like a "tame" kombucha. The "tang" that this CideRoad drink has is kombucha-like, but not as overly harsh. I can taste the ginger, but it's not overwhelming. The blueberry is nice. 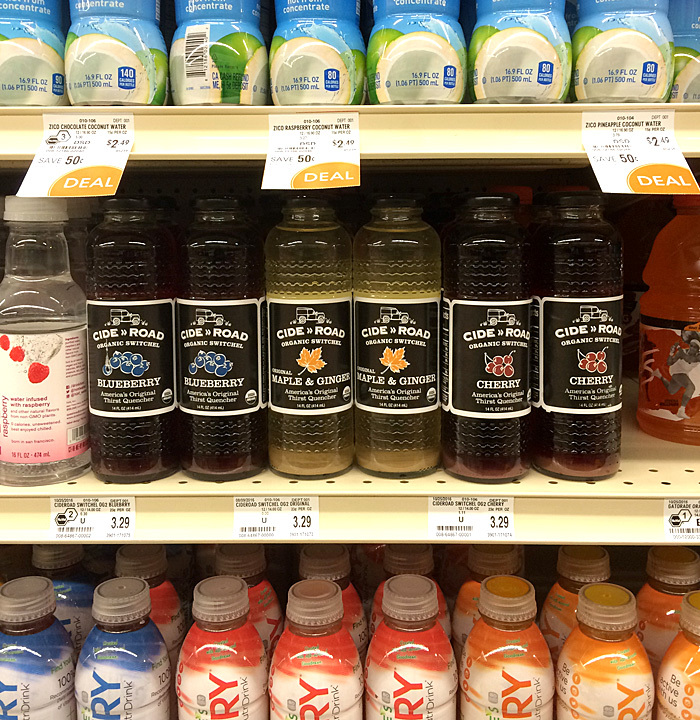 If a "tame" kombucha sounds good to you, give this a try. It would be refreshing for the right person. I just thought it was OK.
A close-up of the label being it's so dark and hard to see in the top photo. Review: This was OK. Just OK. Nothing fancy. It had a SLIGHTLY burnt taste, but it wasn't overpowering. Otherwise, it's relatively smooth with just a slight anise flavor and really no head. It went down pretty easy. I'll give this a slightly above average score based on that last point.